Show the map (right) to a silver-haired birdwatcher and the chances are that they will recognise the distribution as being that of Red Kite, from the 1968-72 Breeding Atlas, even if the 19 breeding dots and 12 dots indicating presence have been shown centrally within Wales. 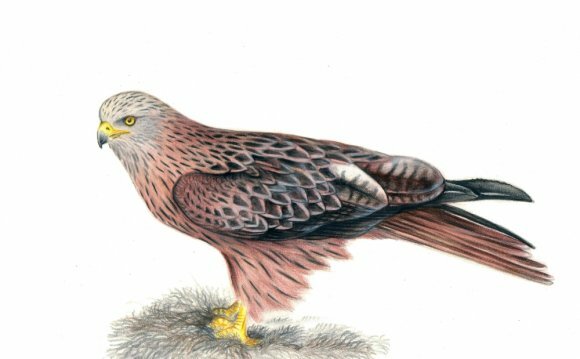 By the time of the 1988-91 survey we were still concerned about revealing the species’ distribution, although the distribution had already expanded within Wales and just into England, to include 45 10-km squares with breeding evidence and a further 37 squares where Red Kites were present. The dots in the south-west had disappeared but there were three sites in Scotland in which birds had been reported, perhaps the first wandering birds from the reintroduction programme that started in 1989. Decisions on whether or not to reveal sensitive information relating to breeding locations of rare species were made at the late stages of previous Atlas projects but, with on-line data input and feedback to volunteers, the issue needed to be addressed at a very early stage, this time around. By working with the UK and Irish Rare Breeding Birds Panels throughout the life of the project we have been able to develop a far more refined set of criteria for the production of maps, as you will see in the sample pages for Purple Heron, Glossy Ibis and Spoonbill in the browsable Bird Atlas 2007-11 sample. The 1968-72 breeding distribution of Red Kite (right) as it appeared in that first breeding atlas, when kites were so scarce their breeding locations had to be shown in a central block, in order better to protect the species. Thanks to the success of reintroductions, Red Kites were found breeding in over 700 10-km squares during the breeding seasons 2008 to 2011. The map alongside shows the clear clusters of red dots around release sites, as well as the establishment of new populations, presumably associated with dispersal by relatively few individuals. The 811 grey dots show squares where kites were seen during the breeding season but not yet breeding. By the time of the next Atlas, currently scheduled to start in 2027, it will be surprising if many areas remain to be colonised in Britain, with Ireland not far behind. As the recording period for the 1968-72 Atlas came to an end, the first sections of the M25 were being constructed but the M40 was probably only a twinkle in a planner’s eye. These days, a day-light journey from Thetford back to the BTO’s old home in Tring would seem very strange if it did not include a handful of motorway Red Kites, such has been the success of the species in the Home Counties. An interesting paper in Biological Conservation suggests that expansion in Scotland has been constrained by persecution (PDF).